Please find below the judging results for your proposal. Congratulations! Your proposal has been selected to advance to the Finalists round. All winners will be announced the week after the voting period ends. Thank you for your work on this very important issue. We’re proud of your proposal, and we hope that you are too. Again, congratulations! - how to ensure that the CO2 basis for the SOL is not sold again on the market. Congratulations! Your proposal, Solar Dollars: The World Currency to Price and Finance Carbon Mitigation, in the Global Climate Action Plan contest, has been selected to advance to the Semi-Finalists round. You will be able to revise your proposal and add new collaborators if you wish, from now until November 4, 2015, at 11:59pm midnight Eastern Time. We’ve also included feedback that will be posted under the Evaluation tab of your proposal. Please incorporate this feedback in your revisions. As you make revisions, we recommend you save an offline copy as a backup. At the revision deadline mentioned above, your proposal will be locked and considered in final form. The Judges will undergo another round of evaluation to ensure that Semi-Finalist proposals have addressed the feedback given, and select which proposals will continue to the Finalists round. Thank you for your great work and good luck! - Would be good to also touch on how this will counteract the perverse subsidies (paid by other currencies) to fossil fuel intensive behavior. - The main proposal presents a detailed concept of the Solar dollar global currency for carbon pricing. It is well-developed and detailed, and contains concrete and actionable steps toward implementation. The main proposal selected a set of sub-proposals, which mostly are relatively irrelevant. The author will have to consider the selected sub-proposals, with a possibility to change/add them with the more relevant ones. I have just completed the reading of your proposal and I can say I not only find it extremely interesting but I also see several common elements with an idea I have been developing since 2007. While in the current contest I am focusing on a sound and transparent way to distribute &apos;reduction duties&apos; between the countries (https://www.climatecolab.org/web/guest/plans/-/plans/contestId/1302401/planId/1323303), and indeed I would be happy for you to have a look at it, this proposal is only a step of a wider roadmap that aims at the creation of a global representative currency in line with your idea. I would be extremely pleased for you to read my writings and, maybe, start a productive discussion about possible future developments. it is great to receive your message. Please allow me a day or two to read the material, and then we should arrange to talk, especially about your proposal for an international monetary system and Low Carbon Bretton Woods. These terms are consistent with Global 4C, and I hope that we can have a (Skype) conversation soon. P.S. our website www.global4c.org is undergoing server change, and so it is not working at this time. 1) SOL is a world currency with supply provide by mitigation, and price provided by a monetary protocol and trading. GER appears to be more centrally controlled, with more attention to quantifying the mitigation duties of nations. With SOL the market is fully international and the SOL rewards create competition to mitigate for SOL rewards. So there is no need to define national &apos;duties&apos; in the SOL mechanism. The SOL mechanism allows leading nations to define currency trade rules and currency convertability rules. 2) The unit of account for GER has 100 kg CO2-e, whereas the SOL is 100 kg CO2-e, and the difference is only for convenience. 3) GER and SOL should both have a rising price for least cost mitigation (rising stringency). 4) GER invokes a single institution for currency issuance. SOL has a decentralized administration for all licensed citizens in the world to be able to issue SOL. 5) GER and SOL are fully international for trade. 6) GER has a single institution for trading. SOL has a decentralized trading system based on the Bitcoin Blockchain and Internet. SOL requires a monetary protocol for central banks to coordinate their fixed trading to manage the SOL price over 100+ years. You call GER a representative currency. SOL is also a representative currency. Both GER and SOL are &apos;service currencies&apos; and by definition they must be &apos;representative currencies&apos; because it is not physically possible to use services as a medium of exchange. SOL is based on a new monetary and market theories that complete the existing market-based Pigovian theory with &apos;symmetry&apos;. This symmetry involves recognition that SOL must be developed and implemented by society, and then ratified by a world authority such as the U.N. Security Council. Central Banks play a major role in protocol creation and negotiations. SOL monetary protocols will require Green Q.E. and this has some similarity with SDR drawing rights. I also agree that a &apos;Bretton Woods&apos; style agreement is the final objective. Generally, SOL will be known as the &apos;peoples currency&apos;, whereas you describe GER as an institutional currency. I found your report  to be rather &apos;wordy&apos;. The central concepts could be summarized more concisely. If you feel comfortable with the philosophy of Global 4C and Solar Dollar, it would be great to collaborate with you given your experience and involvement in climate mitigation policy. Our group is very open to collabroations at levels. 2) The unit of account for GER has 1000 kg CO2-e, whereas the SOL is 100 kg CO2-e, and the difference is only for convenience. thank you very much for your detailed comments. I agree with most of them yet I see limited differences and, most of all, plenty of opportunities to work together on a common platform (e.g. I have been already discussing with several persons about the opportunity to link the overall &apos;Carbon Bretton Woods&apos; idea with the bitcoin opportunity). Yes, I also agree the long report is a bit wordy, yet it allowed me to introduce the overall &apos;roadmap&apos; I designed and to start interesting debates both with academics and policy-makers. We all look forward to your contributions and getting to know you! Please email me with any suggestions to improve the Proposal for Global Climate Action Plan by global4c.org. thanks for the invitation to collaborate on the IMPACT element. Before going on I just wish to stress that, on my opinion, your proposal may find problems similar to ours in such a section (please see our proposal), therefore I believe it will be unlikely to use the available engines to quantify your impact. This of course is just a very first impression but I felt it was better to share it since the beginning. I agree with Michele. Fortunately, I know that Delton has made some own estimates on the impact, perhaps we should use them instead. Thank you for this very intriguing and detailed concept of the Solar dollar global currency for carbon pricing, and your contributions thus far to the Global Climate Action Plan contest of MIT&apos;s Climate CoLab. I am one of the Fellows for this contest, serving as a liaison to the CoLab, here to answer any questions, and help provide substantive feedback toward strengthening proposals. Fellows will also have a role in the evaluative phase of this contest. 1) As you know, in this contest we are asking contestants to draw from the proposals and concepts within the various MIT CoLab regional and national plans, such to help inform in a global strategy. Good work thus far in selecting other proposals that mesh well with your concept. You may wish to continue to detail, however, more specifically and concretely how you view these various regional and national proposals intersecting and contributing to your concept. This is an area that could use expansion. 2) You have a very detailed and well-designed Powerpoint presentation in the Dropbox link. Perhaps there is a way to include some more of the graphics and diagrams from that document within the body of your text to aid in explanation. 3) Make effort to define acronyms during first use (e.g., you use the abbreviation for quantitative easing, QE, in the pitch without defining). 4) Two comments for your consideration in naming structure. a) Why solar, versus any other renewable? It may be worthwhile to explain your rationale in this; b) There is another currency, the Peruvian Nuevo Sol, that is frequently colloquially referred to as the "sol.&apos; This may lend some confusion in having two currencies by the same name. 5) Finally, but not least, I had difficulty accessing the two Solar Dollar websites referenced within the text. Are these sites currently active and publicly accessible? Look forward to seeing how you address these topics, and thank you again for your contributions to the CoLab! thank you Jennifer for your helpful advice. YES, WE WILL ADD MORE DETAIL IN THE COMING WEEKS. I INCLUDED A KEY FIGURE FROM THE POWERPOINT THAT SHOWS THE ARCHITECTURE OF THE SOLAR DOLLAR DIGITAL TRADING SYSTEM AND DATABASE SHARING. GREEN QUANTITATIVE EASING IS NOW MENTIONED IN THE PITCH AND THE ABBREVIATIONS IS PROVIDED. "SOLAR DOLLARS" IS AN APPROPRIATE NAME OF THE WORLD CURRENCY FOR CULTURAL AND SCIENTIFIC REASONS. THERE IS NOT ENOUGH SPACE PROVIDED TO EXPLAIN THIS. THE "PERUVIAN NUEVO SOL" HAS A DIFFERENT TICKER NAME - "PEN" - IN ISO-4217, AND THE PEN IS A VERY MINOR CURRENCY. THE SOLAR DOLLAR WILL HAVE UNIQUE TICKER NAMES IN ISO-4217: "SOL", "SUN", "SAM", "YAN", AND "SOL" FOR REASONS THAT ARE DOCUMENTED IN OUR 2014 MIT COLAB ENTRY AND REPORTS. "SOL" IS SPANISH FOR SUN, AND SO THE WORD IS NOT UNIQUELY ASSOCIATED WITH THE PERUVIAN CURRENCY. THE WEBSITE www.global4c.org IS UNDERGOING A SERVER CHANGE AND WILL BE ONLINE ASAP. An overview of a five currency system is provided in this 2014 CoLab entry for a U.S. carbon price, and in the figure below. A judge in 2014 simply said that he didn&apos;t want a new world currency. The theory for money indicates that a regular political pathway is not necessary for Solar Dollars, and avoiding the political system is the recommended approach.This is feasible simply by developing the currency system like Bitcoin did about 6 years ago, and then creating a new social movement to bring the currency system directly into U.N. negotiations. The www.global4c.org website is now up and running smoothly. Please check it for me, and if you encounter problems, please send me a message. should we have success in finding sponsorship for this project, this URL will come in very handy !! I have completed the Solar Dollar presentation on the MIT Climate CoLab. Please regard this as our first complete draft. Would you please check the presentation and offer your comments? Also, please invited all your friends to vote for our proposal. If you wish to make changes or edits, I would prefer that you emailed me your edits, rather than editing the site directly. This is because the CoLab system has its nuances, and I need to check your ideas and recommendations. Jan&apos;s idea for a &apos;Reforestation Olympics&apos; was brilliant. But I made some recommendations to expand on Jan&apos;s concept, and I recommended changing the name to The Solar Games because the word &apos;Olympics&apos; is actually copyrighted by the Olympic Committe. I absolutely love your renaming of the "Reforestation Olympics" to the "Solar Games" and the accompanying further development of the idea. I think this is a good example of how the climatecolab co-operation platform can work at its best. excellent job! The updated version of the proposal is definitely intriguing and stimulating. We have already had to share thoughts and opinion on the idea all and its innovative value and potential is unquestionable. There is just a point I wish to address: on my opinion the whole proposal may be even more effective if and when a demand of SolarDollars can be established. In other words quantifying absolute reductions related to the 2-degree target as well as defining a fair and transparent distribution system for them is not only an imperative for the future of climate change mitigation. This definition and quantification may serve at clearly establishing the (minimum) quantities of required SollarDollas, therefore avoiding risks such as excessive fluctuation in their prices and aggressive financial speculation. We all know that the Intended Nationally Determined Contributions (INDCs) represent the most likely option to be adopted in Paris to attempt establishing a 2-degree target pathway. We also know that these highly political tools are unlikely to properly work and cover the entire need of emissions reductions for the 2-degree target achievement. This all leads me to propose to keep on working together in the attempt to identify a more efficient, equitable, accountable and transparent system to define the &apos;demand side&apos; of reductions. 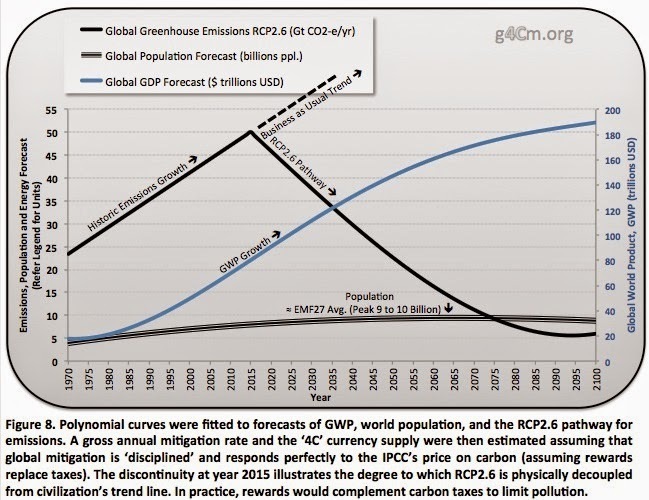 The proposal made here under the name of "Establishment of a sound technical system to distribute emissions reductions" (https://www.climatecolab.org/web/guest/plans/-/plans/contestId/1302401/planId/1323303) goes towards this direction and may be a starting point. I have been sick with a flu for the past 4 days and so I have been unable to deal with the MIT CoLab until today. Sorry about the delay in responding. Michele raised a good question about the quantity (i.e. 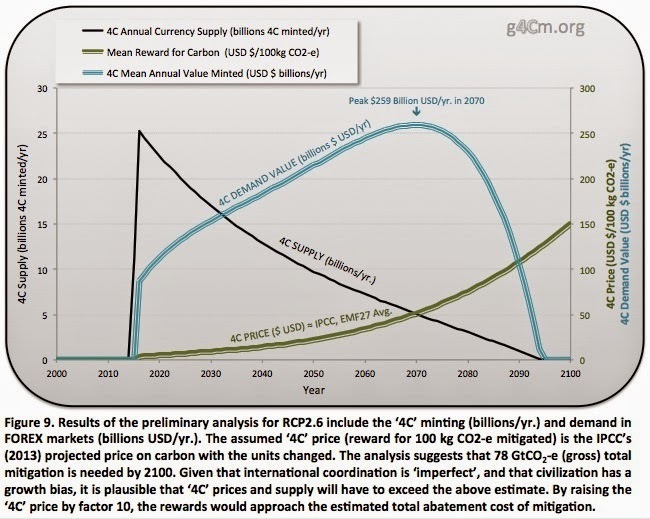 supply) of Solar Dollars to meet the policy target of, say, limiting global warming to 2 degrees C. In our 2014 Global Plan we provided this information - a first-pass estimate of the mitigation scenario, currency price, currency supply and total currency demand (total value) on an annual basis. The key charts from our 2014 proposal are shown below. Although we provided this information in 2014, a judge incorrectly claimed that the proposal was for a &apos;carbon credit&apos; scheme, and then dismissed the proposal from the competition. My learning from 2014 is not to provide too much detail because the judges are not familiar with the policy framework. "Establishment of a sound technical system to distribute emissions reductions" is a fair and reasonable prescriptive framework for a global policy. Unfortunately, all current policy proposals are prone to political delay and opposition. The orthodox economic framework has major trouble coming to terms with this time-delay problem of the political system. Politics operates with different &apos;rules&apos;. Political dynamics has little to do with objective science or economic. The key difference between prescriptive policies (i.e. penalties and regulations) and the Solar Dollar proposal, is that the former requires centralized authority, whereas the later begins without centralized authority (i.e. authority is decentralized). The Solar Dollar proposal is based on a holistic monetary-and-market framework that brings into focus new theories. It is our plan to publish the theories in peer-review journals as a priority. I have updated the figures and references. I also changed the graphic for The Solar Games. I hope you like the new image - I think it is much more appropriate. The editing time ends on Saturday midnight, so if you have any more recommendations for edits, please let me know. Thanks to the judges and fellows for reviewing our proposal. We look forward to making some improvements during the time that remains. thank you for emailing me your suggestions. I have edited the proposal and I am happy with the final product. If you see any errors or problems, please email me. Having trouble finding regional plans to integrate into your Global Climate Action Plan? We have added some “seed proposals” — national and regional plans that have already been proposed by governments or organizations around the world, that you can incorporate into your Global Climate Action Plan. - scenarios through which countries around the world could reach significant carbon reductions, prepared by the Deep Decarbonization Pathways Project (DDPP). The INDC’s and DDPP plans have been uploaded to the Regional Plan Workspace for the 6 major nations/regions: United States, European Union, India, China, Other Developed Countries and Other Developing countries. If you would like to use any of these plans in your Global Climate Action Plan, you can select them under the proposal field, “Which plan did you select for…?” They are located in the Regional Plan Workspace, under the titles: "Seed Proposal: Deep Decarbonization Pathways Project in…” and "Seed proposal: INDC submitted to 2015 UN climate negotiations by…”. Feel free to link to them now; the content will be completed before your revision deadline. Great, we made it into the finals! I have copied the following from the Evaluation section for your information. On behalf of authors and supporters, thank you for your feedback and questions. - how to ensure that the CO2 basis for the SOL is not sold again on the market." Answering the first question involves a business model and contracts that micro-manage the partnerships and prevent free-riding and corruption. The approach involves specific steps, and so there was not space to explain this on the website. Answer 1 - How to finance the auditors and control the currency supply? 1) Enterprises that abate or sequester GHG emissions can voluntarily join the global reward scheme to earn Solar Dollars (SOL) as proportional rewards for the mass of CO2-e verifiably mitigated. They agree to provide their data to a public domain database (for instantaneous market knowledge). They are bound by digital contracts, most of which are actually imbedded in the SOL digital currency. These digital contracts enforce the conditions and assessment rules, including things like duration of safe storage (i.e. for sequestration). 2) Auditors&apos; commissions will be a fixed percentage of the Solar Dollar (SOL) rewards given to enterprises that mitigate. For example, auditor commission may be 4% of all SOL that they award to enterprises. 3) A percentage, say 0.5%, of all SOL rewards will be given to the administrators (shareholders) who own and operate the digital administrative system. 4) The enterprise that undertakes mitigation will first do a self-assessment, and this will be used to define the fixed commission for the auditor. They may be inclined to assess kg CO2-e slightly on the low side, because this will reduce their administration costs. 5) The enterprise has a contractual obligation to do their self-assessment within, say +/-20% accuracy, otherwise they will be penalized an administrative fee (a deposit). 6) The administrative system will chose the auditor for the assessment work, based on skills and capacity, and to reduce the likelihood of collusion and free-riding. 7) The auditor&apos;s commission is already fixed before starting the assessment, so the auditor has no incentive to bias their estimates high or low - they are paid a set commission. 8) The administrative system will do automated and random checks on the assessment to seek out errors or free riding (much like the tax department will do automated checks). With an advanced system, the data can be cross checked with other databases. Also, electronic field monitoring equipment can transfer data directly into the assessment process. 9) The public has access to the mitigation database for oversight and checking. Private whistle blower forms will be available for reporting corruption. 10) Everybody working in the system (people who trade with SOL) can vote on enterprises and auditors with &apos;trust&apos; and &apos;quality of work&apos; metrics. Much like people vote on each other in Ebay and Airbnb etc. 11) If enterprises happen to default on their obligations, or are corrupt, the system has methods to either recover the SOL or declare it void through the digital contracts embedded in the SOL. 12) Enterprises and citizens who earn SOL are allowed to trade it into the global marketplace for fiat currency. Therefore there will be a percentage SOL in circulation that was issued for mitigation that is declared &apos;void&apos;. This &apos;bad money&apos; will be taken out of circulation with a uniform &apos;demurrage fee&apos; applied to all holders of SOL. Hence the &apos;bad money&apos; is removed from the entire SOL supply as a percentage of all money, and not from individuals who happen to buy SOL that should have been voided. This allows everybody to trade SOL without taking other peoples&apos; risk. 13) The demurrage fee represents a social and physical inefficiency of the policy. This is not a fundamental problem, because the monetary protocol will adjust the SOL price higher in response to the inefficiency (i.e. to increase the global rate of mitigation). In other words, when people who own SOL see that their holdings of SOL are reduced (the demurrage fee) the rising price of the SOL will make up the difference. This process will ensure that the unit of account for SOL is upheld. 14) The assessment rules require more discussion. Answer 2 - How to stop CO2-e being sold again on the market? 1) The enterprise that has carbon mitigation to sell, can chose between SOL rewards or a carbon offsets in a carbon trading market. The enterprise will likely chose based on price. 2) The enterprise that mitigates for SOL rewards will enter into digital contract that they will not sell the same carbon to another market (this would be a breach of contract and may be enforced by international counterfeiting laws and criminal charges). 3) Carbon trading and SOL databases can be connected for cross-checking of double issuance. The system can perform all types of database cross-checking to seek out anomalies (i.e. like the tax department). can you please post again in English? The message does not appear to translate.